Share the post "Choosing Between Marriage and Monasticism"
Most young people don’t know how to discover their calling in the life. Whether to dedicate themselves to monasticism or select the marriage path. Some have the feeling that monasticism is a more superior choice than marriage and that marriage represents a lower situation. 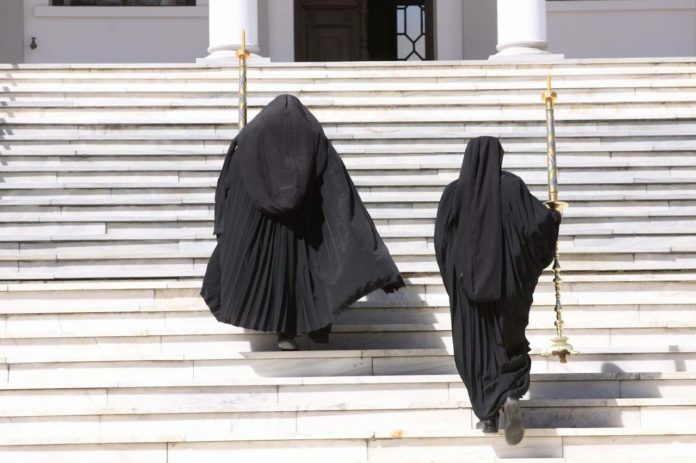 Others believe that any young man who chooses to become a monk is a coward who avoids the responsibilities of citizenship. 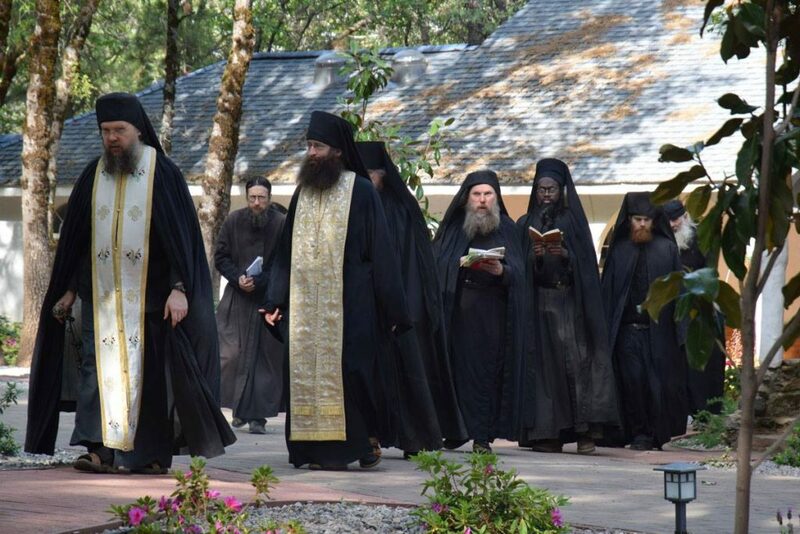 Bishop of Nafpaktos, Hierotheos provides a warm insight and a clear view of the essence of both marriage and monastic life, based on the teaching of the Eastern Church Fathers. “Both marriage and monasticism are powerful symbolic ways of straining toward the ultimate goal of love. Celibacy and marriage are not contrasted with each other; instead, both are compared to and directed to God’s love”. “For as many of you as have been baptized into Christ have put on Christ” (Gal. 3, 27). The essence and aim of Orthodox spirituality presented in the foregoing chapters is delineated in the Word of Christ and the teachings of the Apostles. Many passages from Holy Scripture have been quoted which show that the first Christians lived the spiritual life profoundly, having attained to the illumination of the nous and unceasing prayer. “He that is unmarried careth for the things that belong to the Lord, how he may please the Lord: But he that is married careth for the things that are of the world, how he may please his wife” (1 Cor. 7, 32-33). “But this I say, brethren, the time is short: it remaineth, that both they that have wines be as though they had none” (1 Cor. 7, 29). Thus married people also lived asceti­cally and had experiences of the spiritual life. Moreover, not to be overlooked is the fact that all of the Apostle Paul’s Epistles, sent to the various Churches, were addressed to Christians who were married and had families. And it is within these Epistles that St. Paul speaks of cleansing of the heart, illumination of the soul, acquisition of noetic prayer, of the unceasing prayer of the heart, Sonship by grace, and of life in the Holy Spirit. These epistles disclose that the Christians of the first Apostolic Churches lived as the monks live today in the holy monasteries. When the persecutions ceased, however, and Christianity became the official state religion, seculariza­tion penetrated the Church and the ascetic way of living disappeared from the cities. It was precisely during this time that monasticism developed as an attempt to preserve the essence of the spiritual life. 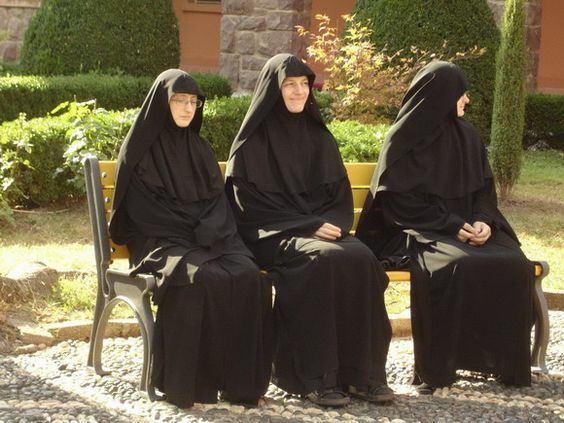 For this reason the holy Fathers emphasize that monasticism is the continuity of the Apostolic age and the life of the first Church; and that the monks are those who live the life of the Gospel, who experience repentance to its ultimate degree and who try to ob­serve the commandments of Christ unyieldingly. 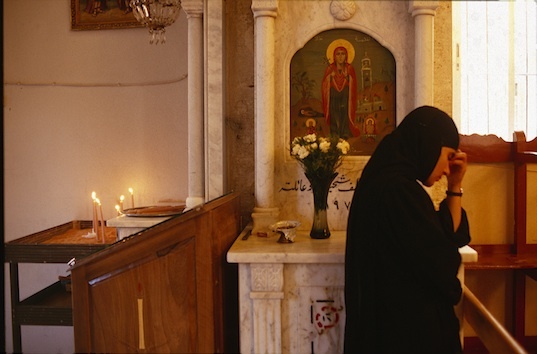 Every Orthodox monk who lives within this atmos­phere is an Apostle of Christ, a Martyr and a Prophet. 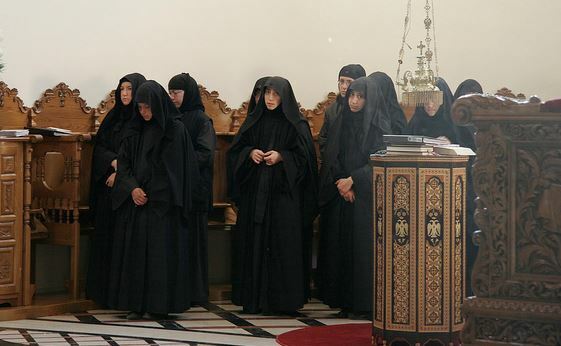 Monasticism is apostolic, prophetic and martyrial life. Monasterie de Mar Takla. Maaloula, Syria. To understand the essence of monastic life, one should read the beatitudes of Christ. The monk com­mences his life in profound repentance with tears of mourning and the cleansing of the heart. In the Gospel and the Apostle Paul’s Epistles all the ele­ments which constitute the genuine monastic tradi­tion, as proclaimed by the Fathers, can be found. These same elements are emphasized in the ser­vice of monastic tonsuring. It states there that during the noviciate period the prospective monk passes through the stage of the Catechumen, living in deep repentance and undergoing purification of the heart. This is the “first love” of which the Evangelist John speaks in the book of Revelation. When repentance is accomplished monastic tonsuring takes place, which is referred to as the “second baptism”. Thus, the monk experiences purification of the heart prior to his tonsure, and ac­quires illumination of the nous while being tonsured. The apostolic life and the way of life of the first Christians, as described in the Pauline Epistles and the book of the Acts, is made visible. Monasticism is apostolic and evangelical; mor­tification of the “old man” precedes it, though, and then the monk becomes a “temple” of the Most Holy Spirit. The prayers read by the priest are expressive of this theme. Married Christians in their personal lives are also called to live the Gospel and the commandments of Christ. No one is exempted from this responsibility. Every one must experience repentance; overcome sel­fishness; and acquire love for God and love for others. It is apparent that the circumstances of married life are different from those of the monastery, and thus a certain adjustment is needed. Yet, what the monastery is for the monk, the family is for the married person. Family is the place for ascetic practice in married life. It is therein that a person is called to carry out the will of God. “O God most pure … bless this marriage, and vouchsafe unto these thy servants, N. and N., a peaceful life, length of days, chastity, mutual love in the bond of peace, long· lived seed, gratitude from their posterity, a crown of glory which fadeth not away. Graciously grant that they may behold their children’s children. Preserve their bed un assailed, and give them of the dew of heaven from on high, and of the fatness of the earth. Fill their houses with wheat, and wine, and oil, and with every beneficence, that they may bestow in turn upon the needy; granting also unto those who are here present with them all those petitions which are of their salvation”. (Rite of the Holy Matrimony). The Church has placed all of its teaching on marriage in the prayers read during the marriage ceremony. The wedded are blessed to live their lives in love and prudence, following the commandments of God. “Be thou exalted, a Bridegroom, like unto Abraham; and be thou blessed, like unto Isaac; and do thou multiply like unto Jacob, walking in peace, and keeping the commandments of God in righteousness. And thou, O Bride: Be thou exalted like unto Sarah; and exult thou, like unto Rebecca; and do thou multiply, like unto Rachel: and rejoice thou in thy husband, fulfilling the conditions of the law: for so is it well pleasing unto God”. (Rite of the Holy Matrimony). The fact that women and men who had been wor­thy of experiencing divine vision in the Old Testament are mentioned in the prayers, demonstrates the as­cetic and saving character of marriage in Christ. The holy Fathers teach that conception, gestation and birth constitute the “garments of skin” which Adam wore after the Fall. God, however, eventually blessed this way. St. Maximos writes that marriage, as we know it today, is a result of the Fall. St. Chrysostom teaches that all of the command­ments of the Gospel -except, of course, for that of marriage-are to be shared by all men -monks and married. St. Basil discerns that both -monastics and the married-are called to uphold the commandments of Christ in the Gospel. St. Gregory Palamas, on the theme of the purity of the heart, declares that married persons can also strive to attain it. The existence of many married Saints who pos­sessed noetic prayer both in the Old and the New Testaments reveals that married people have the capacity to experience Orthodox spirituality in all its manifestations. The prophetess Anna kept noetic prayer within her heart and prayed unceasingly while in the midst of experiencing great pain. 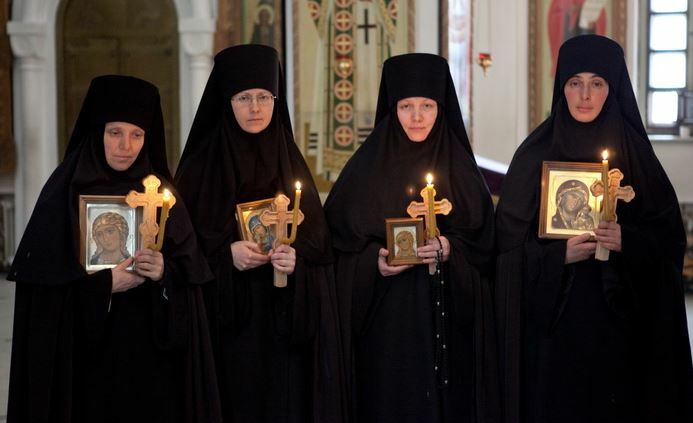 Within the framework of Orthodox spirituality, therefore, Christians are not divided into categories of married and single, monastics and lay people; however they are separated into those who have the Holy Spirit within and those who do not. It is possible for all people to uphold Christ’s commandments and experience Or­thodox spirituality under the guidance of a spiritual father. There are neither privileged nor non-privileged people within Orthodox tradition.